The most prominent wildlife sanctuary in the state of Kerala is the Periyar Wildlife Sanctuary. Here, though, Tigers are fewer in number, yet they attract most of the attention from the visitors. Some of the other animals that can be seen roaming around in the tropical evergreen and semi evergreen forests of the park are Elephants, Otters, Nilgiri Langurs, Common Langurs, Bonnet Macaques, Lion Tailed Macaque, Malabar Squirrel, Wild Boar, Sambar and Barking Deer. Around 200 species of birds can also be seen fluttering their wings in the park. Wayanad Wildlife Sanctuary: Wayanad Wildlife Sanctuary is blessed with a soothing greenery that is heartening as visitors go around sighting animals and birds. Some of the most prominent wildlife species that can be seen here include Elephant, Spotted Deer, Bison, Tiger, Cheetah and Wild Bear. Agastyarkoodam Peak: Around 61 km from the capital city of Thiruvanantpuram lies this immensely beautiful Agastyarkoodam Peak. Towering to height of 1868 m above the sea level, the peak allows trekkers some really exciting adventure. Views of the spectacular 'Neelakurinji', a flower, is completely enamouring enroute. It is said that the peak was an abode of a bachelor sage, Agastya. Hence women are restricted from climbing the peak so as to respect the the status of the renowned sage. The ideal time to undertake trekking here is between the months of December to April. Passes need to be obtained from the forest department of Thirunvanantpuram for this purpose. Chembra Peak: Rising 2100 m above sea level, the Chembra peak is accessible from Kalpetta. The views for trekkers include tea plantation areas as well forests. This trek is considered a bit risky, hence only experienced trekkers should make an attempt to climb it. A half a day trek will take tourists to the summit where a beautiful lake will infuse a sense of renewed vigour in the souls of the trekkers. Pythal Mala: Situated 4500 feet above the sea level, Pythal Mala requires trekkers to undertake a arduous 6 kms trek to reach the zenith of the hill. The spectacular flora and fauna enroute keep the trekkers engaged all the while..
Alappuzha Beach: This beach is famous for its idyllic beauty and leisure options. However for those who love to indulge in a bit of fun, there are options of water sports like surfing and parasailing. Quality aqua-sport equipments are also available to make your water sports adventure completely hasselfree. Kovalam Beach: This beach is just perfect if you wish to indulge in a variety of water sports activities - swimming, kayaking, surfing and skiing. You also have an opportunity to try your luck at angling here. However, there are certain rules to be followed and certain precautions to be taken if your enjoyment is to be complete. Varkala Beach: Varkala beach is known for its religious significance, nonetheless, opportunities to enjoy water sports here are equally interesting. Most prominent of water sports that you can enjoy here include parasailing, scuba diving and windsurfing and even deep sea fishing. Boat Races Kerala is well-known for its boat races along with the water sports. 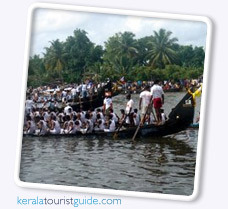 Kuttanad and the upper Kuttanad area are mainly famous for the boat races. The annual boat races are a source of entertainment, celebration and gaiety for the locals comprising majority of the agriculturists and fishermen. These annual boat races are the platform for proving the physique and muscle power of the people of a Kara locality of Kuttanadu. Among the several boat races of Kerala the chief are the Nehru Trophy Boat Race, Champakulam Moolam Boat Race and Aranmula Boat Race.